Bangkok has so much to discover, with it bringing in people from all corners of the planet, what better way to explore it other than a night tour in a tuk-tuk. Want to know more? The Klongsan Plaza night market is both vibrant and busy. What used to be a train station in the past is today home to a wonderful market. You’ll find many cool items here from shoes, trendy clothes, jewellery, accessories and jeans. You’ll also come across many street foods stands as well. The Wat Prayoon is a 138-year-old temple that was built during the period of King Rama III. It has received the UNESCO Cultural Heritage Conservation Award of Excellence in 2014. You’ll see a large inverted bell shape pagoda and turtle pond where you can feed the little creatures. If you haven’t tried this dish yet, there’ll be many spots on your tour where you can stop and consume some. Bangkok serviced apartments are an excellent choice for accommodation when you’re in the area, with many to choose from, like the Anantara Baan Rajprasong Bangkok Serviced Suites for instance. A must see when you’re in the city is Bangkok’s, Giant Swing. Located right beside the Wat Suthat, you simply cannot miss it. This iconic swing is over 21 metres tall and is painted red. 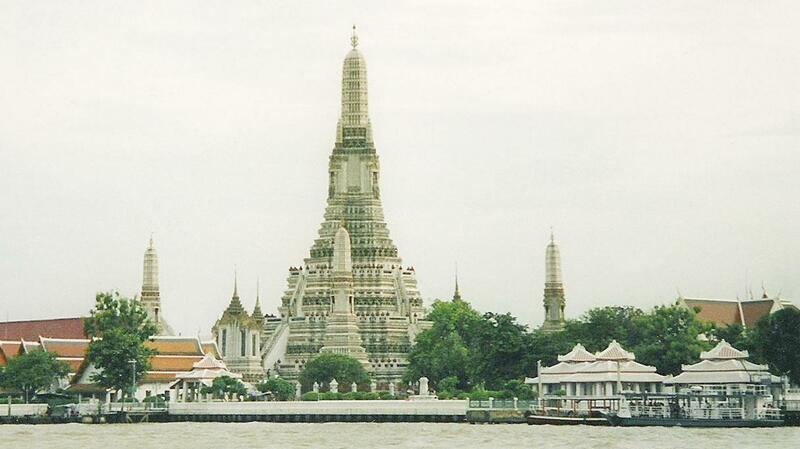 It was built by King Rama I in 1784. Shopping Experience in Bangkok – An ultimate retail therapy! Bangkok is just more than a picture-perfect city filled with attractions. The city boasts a wide selection of shopping centres with chic Asian and international design. Do read on! If you wish to shop at a fancy mall that is popular among the rich and famous in Bangkok, then Siam Paragon will be an ideal choice. You can find international designers and high-street brands along with some high-end electronic shops and homeware stores. Many Bangkok serviced apartments the likes of Anantara Baan Rajprasong Bangkok Serviced Suites are located in the vicinity and it is convenient to gather up on some goodies for yourself. You will be able to shop across the world under one roof when you shop at Terminal 21. You will find different shops from Tokyo city and then moving towards London’s Carnaby Street, moving on to Istanbul Zouk or perhaps keeping moving towards Fisherman’s Wharf in San Francisco and shop across the world. If you are looking for local brands and local products, then the Siam Centre is the ideal location as you can find most of the local brands under one roof. The products make great gifts and souvenirs to take back to give to your loved ones. This is the largest mall in Thailand! It is one of the biggest attractions for the youth as you can see many youngsters coming to the mall to spend their leisure time. The mall has many luxury and designer clothing brands as well as shoes and accessories such as bags and jewellery. Bangkok at night is a dazzling sight, especially along the banks of the mighty Chao Praya River. And a visit to the city isn’t complete without a dinner cruise along the river. There are several tour operators and hotels in Bangkok like Anantara Baan Rajprasong Bangkok Serviced Suites for example, that provide guests with memorable river cruise experiences. Almost all of them will take you past beautiful landmarks like Wat Arun, the grand palace and many other glittering temples. In most cases the cruises are split between two kinds of boats, the first is the traditional Thai rice barge which lends an authentic feeling to the experience, and the second, a modern cruise vessel. Both offer the same in terms of cruise and dinner. But the rice barge adds something extra to it. 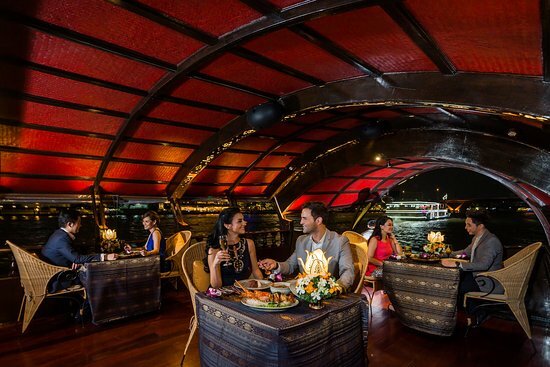 When you book a Bangkok river cruise, dining options are something you should be aware of. Many cruises offer morning, afternoon, and dinner services with either buffet or a la Carte. Each one with a different menu. If you have any allergies, do check ahead with the operator on dining options for you. Many of the cruises provide traditional Thai dance performances or even karaoke sessions during the cruise. If you’re interested in taking in a performance, do try to book ahead to get good seating. While being a fine metropolis keeping up with the world, Bangkok also keeps the very essence of Thai culture alive. Amongst the city lights are the sparkling jewels of history that laid the foundation for a rich culture and the fantastic city Bangkok is today. Silom road is a busy street by day with trading activities going on while at night the city transforms into the ultimate spot for nightlife in Bangkok! There are several attractions like Lumpini park and restaurants serving various types of delicious cuisine. Certainly, a colourful city with malls to shop till you drop! Step into the biggest mall in Asia, Paragon for a delightful experience. Moreover, there are plenty of places to visits, namely, Jim Thompson’s House, Madame Tussauds, Bangkok Art and Culture Centre and more. Step out of your service apartment in Bangkok the likes of Anantara Baan Rajprasong Bangkok Serviced Suites and set off to take a look at the Chinese side of life in Bangkok! Have an enthralling culinary experience while learning the culture in this part of the city. This is the part of Bangkok that is mostly crowded with tourists. Boutique hotels are filled with backpackers. Explore special monuments such as Wat Sa Ket, Democracy Monument and much more. Want to hobnob with celebrities, rub shoulders with eminent heads of states, or maybe get up close and personal with some famous athletes? Then how about heading to the Madame Tussauds Bangkok? Madame Tussauds Bangkok is no ordinary wax museum! The unique space showcases 10 exhibit rooms under different themes such as film industry, sports, history and the royal room featuring over 100 realistic wax figures of famous people such as David Beckham, Michael Jackson and Princess Diana. The true to life settings and interactive displays give visitors an abundance of opportunity to have tons of fun and unleash their inner creativity to take some funny pictures with their favourite A-listers and more. Located on the 6th floor of Siam Discovery Mall, the Madame Tussauds Wax Museum can be easily reached from many a Siam hotel in Bangkok including the likes of Anantara Siam Bangkok Hotel. Those taking public transport can board the No. 15, 16 and 25 buses. It’s also a mere 5-minute walk from the BTS Siam Station. If not, one can also hire a taxi or a private vehicle. The wax museum is open to the public from 10.00 a.m. to 9.00 p.m. daily. Consider purchasing tickets online as it is relatively cheaper than buying them at the counter. Thailand is known the world over for its spas and unique spa techniques. Those treatments are more than just a routine or another way to stay healthy and disciplined! Does stress at work takes a toll on your health and productivity? The classic spa treatments will help to reduce stress and thereby to regain the balance between your mind and body. Most of the Thai spas and wellness centres are set in a calm and relaxing environment to ease your mind. The combination of elements like physical therapy, massage, and yoga in Thai spa treatments have the ability to increase your body energy to rediscover the young you! If on a holiday in Bangkok, experience some of the heavenly Thai spa massage techniques at one of the many Bangkok 5 star hotels the likes of Anantara Sathorn Bangkok Hotel, and relieve your body pain. Thai massages have the ability to stimulate the movement of blood in different parts of the body. While continuous body movement helps to maintain proper circulation, the pressing and touching techniques help the flow of blood. Moreover, the yoga-like positions will aid to enhance one’s flexibility to reduce muscle stress and strain. After a rejuvenating treatment, feel extremely relaxed filled with optimism. The perfect balance between your mind and body will ultimately let you feel a good mood throughout. In the midst of a concrete jungle is half a million square meter mass of greenery that calls in the city dwellers to become one with nature. 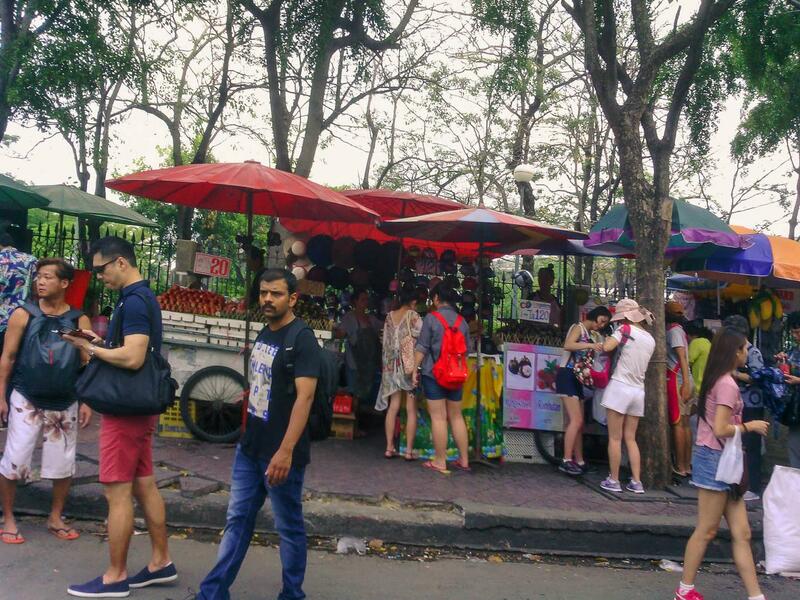 The park has grown during the years and has eventually turned out to be a popular hangout spot among those living in Bangkok and home to various plant life and wildlife as well. The huge park is brightened up with various plant and animal species like scary but harmless monitor lizards. Come early morning, the park is full of joggers and people who wish to indulge in a simple workout in the outdoor gym. Towards evening, one will come across lovers in a quiet corner and even the working crowd who have decided to take a breather for some fresh air. The park is just a short distance away from hotels like Anantara Sathorn Bangkok Hotel. So, head over for a fun time. Searching for things to do in Thailand in Bangkok? Work up a sweat by joining the free aerobics session before sundown. In a game mood? Have fun at the basketball court or try your hand at fencing. There are ballroom dancing classes available at the pavilion in case you feel like swaying to some beats. There are also entertainers like orchestras that perform at the park on Sundays and you get to enjoy for free! Suppose you simply want to relax and feel the comforting touch of nature, why not promenade down the winding pathways that are spread out around the park? There are plenty of shady spots to sit and read a book or even take a small nap. Also, don’t be surprised to if a reptile or two pop their heads out to sunbathe. Never fear, they mean no harm! Getting hungry already? Find some of the freshest meal here cooked then and there in the stalls set up inside the park. 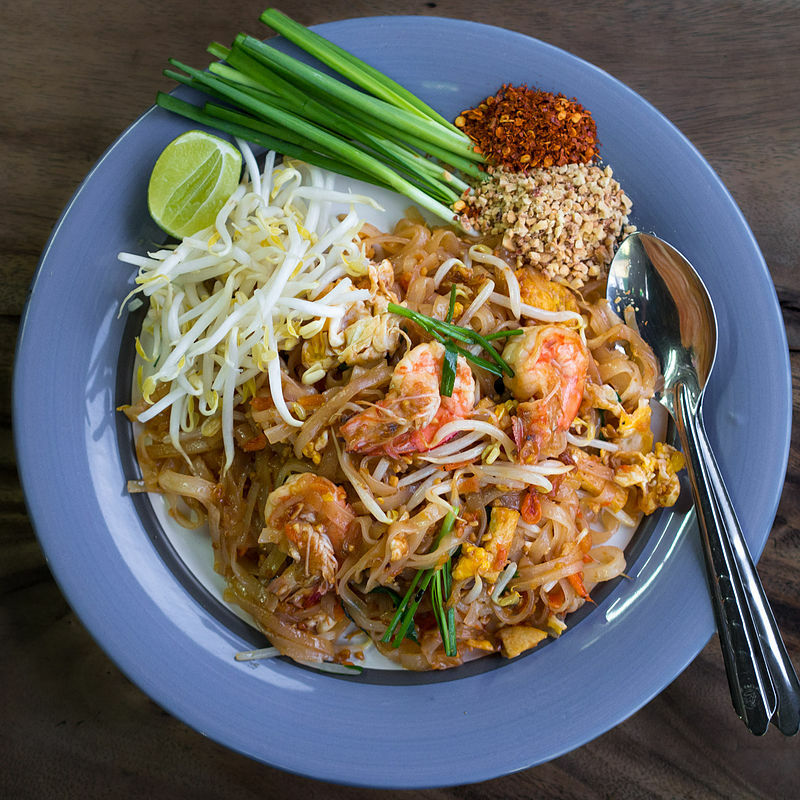 Have a detox dose of wheatgrass juice or a yummy dish of Pad Thai or even some Chinese snacks.